What if the Axis powers had won World War II? That’s the question asked, and answered, by a TV drama I’m currently watching on Amazon. It’s called the Man in the High Castle. It’s set in America in 1962 in a world where the Axis powers won the war in the early 1950s. For about ten years, they have ruled over most of the American continent, leading to a life of ordered oppression. Everything is orderly, everything is in its proper place, there’s little crime, there’s little worry and fear about the future, because the state controls everything. That means that the average person lives under severe oppression and many constantly face fear of death. Evil has won. There’s no doubt in this series that the purposes of evil people and governments have won the day. Resistance workers fight against it, but their efforts are small and seem futile compared with the massive states that rule the day. Such dramas are popular right now in our collective imagination as a country. We call these fictional worlds that feel close to reality dystopias. Consider how many dystopias we’ve known in the last few years: The Hunger Games, The Handmaid’s Tale, the Divergent series, Westworld, Colony, just to name a few. These are all dark movies and series, with little hope of the future save for the actions of a few renegades who dare to buck the system. But even then, there’s more despair than hope, more darkness than light. For all its darkness and despair, dystopia is popular right now. Perhaps that’s because we feel like a people who are afraid of the future. Things seem more dark than light. We’re given more reason to despair than hope. Such was the case for John, the author of Revelation, while imprisoned on the island of Patmos. The vision he sees, recorded in our scriptures as Revelation, is at times reminiscent of dystopia. It records the cosmic battle between good and evil, gives symbols for the end of the world; it’s dark, full of violence both in heaven and on earth. For John, this must have been somewhat upsetting. He’s on the island of Patmos, in jail, for sharing his faith. He receives this apocalyptic vision during a time of high persecution for Christians at the hands of the Roman emperor. Christianity had grown so large, so quickly, and was so unpatriotic, that the emperor considered it a threat. Many Christians were simply fed to the wild animals in the Coliseums around the empire; a sporting event in which patriotic Romans got to see Christians, threats to the empire, devoured for fun. But some were imprisoned on islands like Patmos, places to be tossed away and forgotten, barely eking out an existence. It was a dark time for John, a dark time for Christians, and Revelation often offers a dark vision. Up in heaven, John witnesses the cosmic battle happening between good and evil. This has consequences for what happens on earth, too; and, indeed, what happens on earth has consequences for the battle in heaven. There’s a two way street that John becomes aware of through his vision, this book, which is really what Revelation is about, rather than being about forecasting the end times, like so many have understood it. Much ink has been spilled trying to “unlock” the symbology of Revelation. Each era in human history since its writing has thought that the symbols spoke to their time. I can remember my mom talking about hearing that bar codes were the mark of the beast. When books were first invented some five hundred years ago, they were the mark of the beast. Every era has thought that the time described by Revelation was their time. And I think such efforts to discern if we’re in the end times, or what the symbols represent for the future, are futile. We can’t know any of that, but we can know what the symbols meant for John and for the earliest Christians. They are reminiscent of the Roman Empire. The beast, the scrolls, the trumpets, the dragon, all speak to elements of Roman civilization. There’s no doubt, Revelation casts Rome as evil. And for much of the book, it seems like the Romans are winning, which means evil is winning. The evil side of the cosmic battle in heaven seems aided by the Romans who are the chief purveyors of evil. Thus Revelation can be, indeed, dystopian: dark, violent, unsettling. But, just like in our modern day dystopias, the actions of a few make a difference. The actions of the renegades who dare to stand up for what’s right make a difference. The actions of these Christians across the empire who dare to do what’s right, witness to their faith, remain committed to Christ no matter their suffering; they make a difference both against the Romans and in the heavenly conflict between good and evil. There’s yet hope that exudes from the book, for the individual actions of Christians like John make a cosmic, heavenly, difference in the battle between good and evil. Evil has lost. Heaven and earth are merged into one, now no longer divided. There is no more suffering, no more tears, no more death, no more pain. Good has won. Evil has lost. All of humanity, in all of its diversity, are gathered together as one, all radiating the glory of God, alive forevermore. Revelation goes on to describe this New Jerusalem as a city version of the Garden of Eden. Scripture begins and ends in a garden. We begin and end in a garden just as we begin and end with God, the Alpha and Omega, which is the Greek version of God saying “I am A and Z,” the fullness of everything. We were created in God’s image and it’s to that kind of full unity with God that we return and that all of humanity will return when good has finally, once and for all, won. Love will carry the day and be victorious. This is highly different than the dystopias that are popular today. We are consumed with images of a world that’s descending toward evil rather than ascending toward heaven. We face an onslaught of fictional tales that declare to us that the world is ending, that evil is triumphing, and there’s not much hope for any of us. Scripture tells us differently. For those of us who are in Christ, we know the ending. There may be violence and suffering until we get there, but there’s always reason to hope because we know the ending, the one that’s recorded right here in chapter 21 of Revelation. We will end as we began, in a garden, in full unity with God. Which is exactly the reality that the saints who have gone before know today. They are there, in the garden, in full unity with God. For them, verse four is not some far off future but a present day reality, “[God] will wipe every tear from their eyes. Death will be no more; mourning and crying and pain will be no more, for the first things have passed away.” Both for those members of our church whom we will remember in a few minutes and for those you hold in your heart today, those who have passed on from us to this glorious future, theirs is the glory for they know only the joy of unity with God. But that’s not all there is to the story this morning. There’s a word for us, too. Hear again verse three, “‘See, the home of God is among mortals. He will dwell with them; they will be his peoples, and God himself will be with them.’” This is a promise we hear not just in Revelation, but in prophecies elsewhere in scripture. In Zechariah 2:10-11, God says, “Sing and rejoice, O daughter Zion! For lo, I will come and dwell in your midst, says the LORD. Many nations shall join themselves to the LORD on that day, and shall be my people, and I will dwell in your midst,” a promise to come and be with us. And again, in Jeremiah 31:33-34, as God is announcing a new covenant, God says to the people and to us today, “I will put my law within them, and I will write it on their hearts; and I will be their God, and they shall be my people. No longer shall they teach one another, or say to each other, ‘Know the LORD,’ for they shall all know me, from the last of them to the greatest, says the LORD; for I will forgive their iniquity, and remember their sin no more.” Such prophecy holds powerful promise that God is with us, that God is Immanuel, just as we celebrate in Christ. For in Christ, we have received the fulfillment of these prophecies, in Jeremiah, in Zechariah, and in Revelation, “‘See, the home of God is among mortals. He will dwell with them; they will be his peoples, and God himself will be with them.” Such comes with a promise to “wipe every tear from their eyes. Death will be no more; mourning and crying and pain will be no more…” For in the darkness, a light shines. Not just in the future, but now, too. We know that’s true because that’s what our Savior did for us and continues to do for us, just as we say in Isaiah 9, read during each Advent, “The people who walked in darkness have seen a great light; those who lived in a land of deep darkness–on them light has shined…For a child has been born to us, a son given to us; authority rests upon his shoulders, and he is named Wonderful Counselor, Mighty God, Everlasting Father, Prince of Peace.” (Isaiah 9:2-3, 6). The saints know this promise in its fullness, and we know it through the dim glass, as Paul says. We know it in part, they know it in whole. But because we know it in part, we have hope because we know this world is ascending to heaven, not descending to hell. We have hope for the future, for we will know this glorious future just as the saints know it today. We see a glimpse, we experience it in part, but all of that tells us that God fulfills God’s promises, that our savior lives, and so we have hope.This promise, this prophecy in Revelation, is here and now. Christ has paved the way for us to not only know in our heads that good will win, but to know in our hearts that good will triumph. Christ has come and dwelled with us, within us, not only enabling us to experience the hope that texts like Revelation provide, but to experience hope in the midst of our own sufferings. And to know that, as we do good in the world, as we do what Christ asks us to do, as we live lives worthy of his suffering and death for us, is to know that God is using our works in the cosmic battle between good and evil. What we do here rings in eternity. That is what we remember and celebrate on this All Saints’ Sunday: we have hope for the future, a hope we saw embodied in their lives. Those we hold in our hearts, and the eight church members we will remember here in a moment, demonstrated for us what it is to live lives worthy of the call, worthy of the cross, worthy of knowing Christ. In them, we saw how to suffer with hope, we saw how to love others. In them, we learned how to run the race of life with perseverance, we saw exemplified the scripture that says, “whomever is faithful in little is faithful with much,” we saw the power of authenticity where one’s outward life and inward life are the same. We saw, above all in the saints, the old Latin saying, “Dum Spiro Spero;” which means “While I breathe, I hope,” for that they did, and their witness lives on within us, providing us with hope. What they did rang in eternity. What they did aided the cosmic battle between good and evil. So we, too, can say Dum Spiro Spero; while we breathe, we hope. We hope because we know that, just like the saints we remember today, what we do rings in eternity. What we do has consequence for the cosmic battle between good and evil. What we do helps to bring about heaven on earth, where there is no longer any division, but only unity with God, a new Jerusalem. 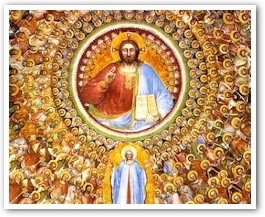 What we do brings about what we say in the Doxology, “as it was in the beginning, is now and ever shall be; world without end, Amen.” We are saints, for we have Christ who lives within us, who takes our actions and magnifies them in heaven. Evil doesn’t win. Good triumphs in the end. The question before us is simple: are we living a life worthy of the saints we remember this day? Are we living the lifestyle God calls us to, one that gives love to the world unconditionally? For when we do so, we contribute to the coming of the New Jerusalem, the renewed garden; we contribute to the cosmic battle between good and evil. For those of us who are in Christ, we know the ending. There may be violence and suffering until we get there, but there’s always reason to hope because we know the ending, the one that’s recorded right here in chapter 21 of Revelation. We will end as we began, in a garden, in full unity with God. Dum Spiro Spero. While we breathe, we hope. And so we say, with the very last verse of all of Scripture, “The grace of the Lord Jesus be with all the saints.” Amen, and Amen.